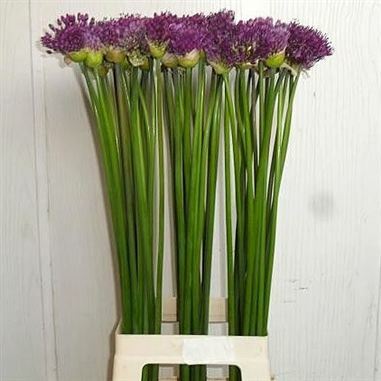 Allium Purple Sensation are also known as ornimental onions. Their globe shaped blooms are made up of tiny purple flowers. 60cm tall & wholesaled in 10 stem wraps. Alliums, (otherwise known as Ornimental Onions), are hybrids that have been bred for their wide variety of colours and flower head sizes. Originally native to the northern hemisphere, the Allium is a genus of perennial bulbous plants that produce a chemical called cysteine sulfoxide - this chemical gives the allium the unpleasant odour of onions! (Stronger in some varieties than others).